Currently reading: We didn’t make any progress on Library of Souls by Ransom Riggs during our trip this weekend. We had a few things on our minds and used the time to talk instead. There are worse things in this world! Not much with The Book of Speculation by Erika Swyler because I’ve been out-of-town so much but I’m still really enjoying the book and I hope to keep moving on it! I started another comedian memoir because I needed something light to read over my vacation. I grabbed You’re Not Doing It Right by Michael Ian Black from my shelves. I enjoyed his commentary on the VH1 I Love The… series and I watched Wet Hot American Summer last summer and remembered how funny he was. The book is a great delivery of his dry humor and I’m really liking it. I also just started The Mother Tongue by Bill Bryson. I’m glad Bryson seems as fascinated by the English language as I am! Sometimes I find myself wondering how much money a linguist could make because it’s so fun! Recently finished: I finished Fantastic Beasts and Where To Find Them: The Original Screenplay by J.K. Rowling last Thursday. It was a super quick and fun read. I’m super excited for the movie to come out so I can watch it again from home this time! I’ll likely post a review tomorrow. I also finished The First Phone Call from Heaven by Mitch Albom on Thursday, it was a big day for me! This was a good audiobook and I really liked that Albom narrated it himself. I posted my review on Monday so please go check it out and see why I gave it 4 out of 5 stars. I posted one other review, Is Everyone Hanging out Without Me? by Mindy Kaling. I gave it 3 out of 5 stars, please check it out! Reading Next: I know I’ve been saying it for weeks but I picked up Night Soldiers by Alan Furst from the library last night! I’m going to start in on this one as soon as I finish Black’s book, which I hope is really soon! ← Mental Health Day: I’ll Be Back Tomorrow! Thanks, they’re all fun so far. Happy reading! Happy to hear you liked Fantastic Beasts so much. I’ll be keeping an eye out for your review. I was glad I liked it, too! I don’t read a lot of screen plays so it was different but having seen the film helped. Happy reading! I’ve got a book for every setting haha. Happy reading! The Mother Tongue sounds fantastic! It’s really fun so far. I hope to listen a lot this weekend. Happy reading! I loved Fantastic Beasts! Would you say its better or worse than Harry Potter? Oh gosh, that’s hard. I love the 20s but I know the HP characters better so I have to say the original seven… for now! Happy reading. Mmm, well I definitely like Newt more than Harry because he just has more of a personality and is more eccentric, but otherwise my answer is definitely the same at the moment. I do prefer the Fantastic Beasts film to the original films though. I think I liked FB so much because I hadn’t read the story already. I didn’t have a preconceived idea of what the film would be like and every little thing that was different from the text bothered me. With FB, I went in with no clue of what I would see and everything delighted me. I haven’t read Fantastic Beasts (or Harry Potter for the matter) which is just so sad but I’m glad you enjoy it! I’m thinking of watching the movie this weekend and I’m so excited! Hope you enjoy your other books as well! The movie is really great, I hope you like it. I hope you can read Potter soon! Happy reading! Haha, me too! I’ve been waiting forever. Happy reading! I haven’t read any comedian memoirs, I don’t seem to read that many memoirs in general, but I do want to read Amy Poehler’s. I’ve wanted to read a Bill Bryson book for a while. He seems to know so much about everything! Poehler’s is funny but I personally preferred Tina Fey’s. Bryson is an amazing researcher so I’m really looking forward to this book. Happy reading! Haha, I’ll have to follow him on Twitter. If you get his dry humor, I think you’ll like his book. Happy reading! I’m thinking about getting Fantastic Beasts for my daughter. Would you say it’s child-friendly? I would say so. There might have been one curse word and two characters die, but it’s not gory because it’s magic. I think the film was PG13 if that helps. Happy reading! Glad you enjoyed the screenplay 🙂 I look forward to reading it for myself soon. Hope you find some time to get through The Library of Souls. Thanks as always for hosting this! I wish my husband and u had more time together. Dang school! Happy reading! Mindy’s was fun to be sure. Black’s is good in a different way, though. He’s very dry. Happy reading! I loved the Fantastic Beasts screenplay! Great! I hope to read more of them soon. Happy reading! Night Soldiers sounds good, can’t wait to hear what you think! 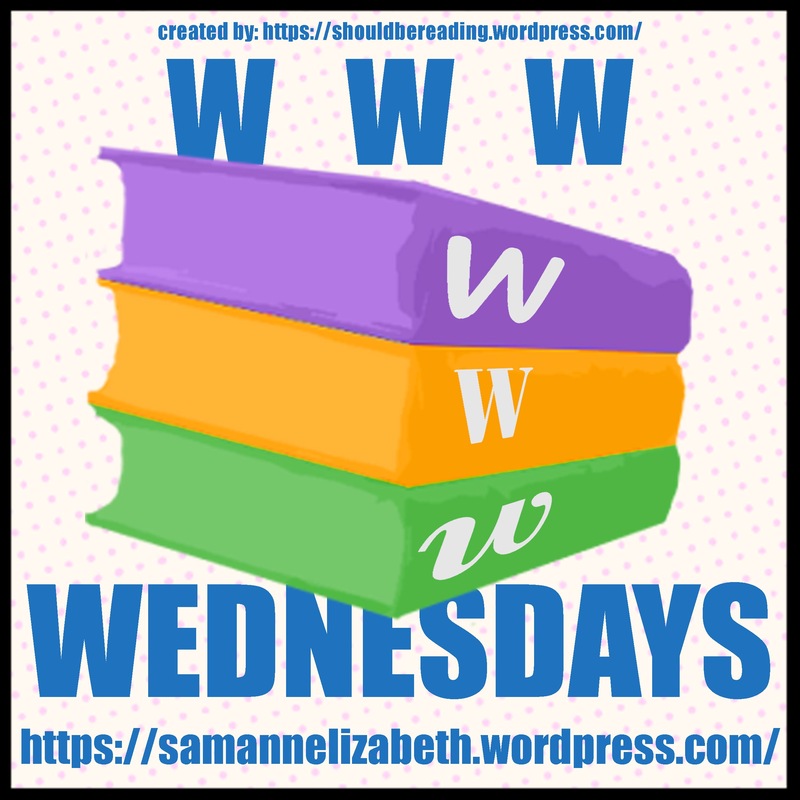 Here’s my WWW Wednesday for this week! I’m really hoping to start it soon! I’ve got a busy weekend so positive thoughts. Happy reading! I haven’t thought to compare it to Cursed Child too much. I think my letdown with CC was based on the plot, but since I’d already seen FB, I wasn’t thinking that way. Happy reading! You’re Not Doing It Right sounds like it would be a fun read. Enjoy! It has been fun. It’s a good laugh before bed each night, haha. Happy reading! It’s been good so far, I hope it continues that way. Happy reading! I loved Michael Ian Black on a little show called Ed, that nobody watched me. Here’s my WWW https://readinaflash.wordpress.com/2017/02/22/www-wednesday-35/. I remember my dad watching Ed. The bowling ally lawyer, right? The guy who stared in that was in The Flash. I didn’t know Michael Ian Black was in it! Happy reading. Yes, he worked in the bowling alley. He was super snarky and funny. I’m not too far in Bryson’s book yet but he is on point with this one, very enjoyable. Albom was a fun read. He had a great twist on it at the end that I wasn’t expecting. Happy reading! I thought about saving it, but I knew I would devour it in a heartbeat and I had a few days between books, haha. Happy reading! I found Bill Bryson’s A Short History of Nearly Everything fascinating, but have been afraid to try anything else of his. I rating Kaling’s book about the same as you. Was it the one where she had a short story that was an alternate reality? If so, that story really threw me off.. I haven’t read that one, but I liked another of his books about English so I thought I’d give this a try. I remember Kaling’s books with short stories she’d tell herself while running to make her run faster, but I don’t remember an alternate reality per say… Maybe you read a different one of her memoirs than I did. Happy reading! It’s gorgeous and the art inside it is amazing as well. Happy reading! I’ve been thinking about getting Fantastic Beasts – I read the Cursed Child script and enjoyed it. I’ll keep an eye out for your review! I’ll be writing it up tonight. Happy reading! As always, you’re reading so much right now! I’m trying to get back in the swing of reading more than two books at a time. Maybe once I’ve had more time to recover from this blasted cold…. Ugh, speaking of colds… Not feeling my best today and I had to leave work early! It’s so exhausting to be sick. I hope you feel better soon and can get back to reading a ton. Happy reading! Just watched Fantastic Beasts on the weekend and enjoyed it. I hadn’t planned to read it – but your praise has made me add it to the ever-growing TBR list. Haha, I hope the read is worth it! I enjoyed reading the stage directions and such after having the movie in my head. It helped me understand it a little better. Happy reading! I still have to get a copy of Fantastic Beasts! It sure sounds like a fun read… And I imagine having The First Phone Call From Heaven told by Mitch Albom himself is a huge bonus. I hope you will enjoy your books this week and happy reading! Here’s my WWW. Fantastic Beasts really is a fun read and such a beautiful publication. Phone Call read by the author was fun. Albom sets a lot of books in Michigan so hearing him talk about his home state is really fun. Happy reading! I’ve seen a lot of beautiful photos of Fantastic Beasts and it looks like it’s worth getting a copy for its looks alone! And I can definitely imagine that. Happy reading and thanks for hosting! I’ll get to reading Fantastic Beasts one day. I completely missed seeing it in theaters when it was out. Need to buy it as soon as it’s available. Working my way (slowly) through Cursed Child and it’s . . . interesting. I’ll leave it at that. I’ll be at the store the day it comes out, too! I’m so excited to own it. Cursed Child was different only because after so long, it almost felt like fan fiction! Happy reading. First time contributing a post of my own 🙂 Happy reading! My WWW post is up. I’m a huge Potterhead. I liked that this book was in the same world but dealt with completely different characters and villains. It was really fun. Happy reading! Great! I’ve heard good things about the movie from friends. You’ve seen the movie too? Does it compare to the book? The movie was great and it was exactly like the book. Nothing cut or added, it’s the final version screenplay. Happy reading! It took me this long to start it but once I did, I flew through it. I hope you can enjoy it soon, too. It was a fantastic Christmas present. Happy reading! I put off reading it a long time just because my husband and I didn’t have any time to listen to it for so long. I’m still not sure when we’ll finish it, haha. Happy reading! Have a fantastic week, and thanks for hosting. The movie was really well done. I’m glad they got the same director who did the last few HP movies because it had the same feel to it despite all the different characters and setting. Happy reading! It was a really fast read and of course having seen the film, I knew what was going to happen, but I was still able to enjoy it. It helped me see some details in scenes that I hadn’t noticed watching the movie which was fun. Happy reading! Haven’t read neither the play or the screenplay from Harry Potter series. Are they necessary to that world? The stage play is like a sequel to the original seven. The screen play is a prequel with completely different characters, just in the same universe. You could read it as a standalone. Happy reading! The movie was really fun, I recommend it. I wasn’t a huge fan of Night Soldiers but I pushed myself through. Come join us for this week’s post here. Happy Wednesday!